This page is an index to The Poem Farm poetry peeks into classrooms and studios around the United States. From celebration ideas to poems through the year, these links are full of richness. To read each peek, please click on the title, and once you reach the post, simply scroll down past my poem to the words of teachers and writers and students. I recommend reading these posts as inspirations for your own classroom and sharing the student poems as mentors for your students. I extend many thanks to all of these writers for their generosity of spirit! 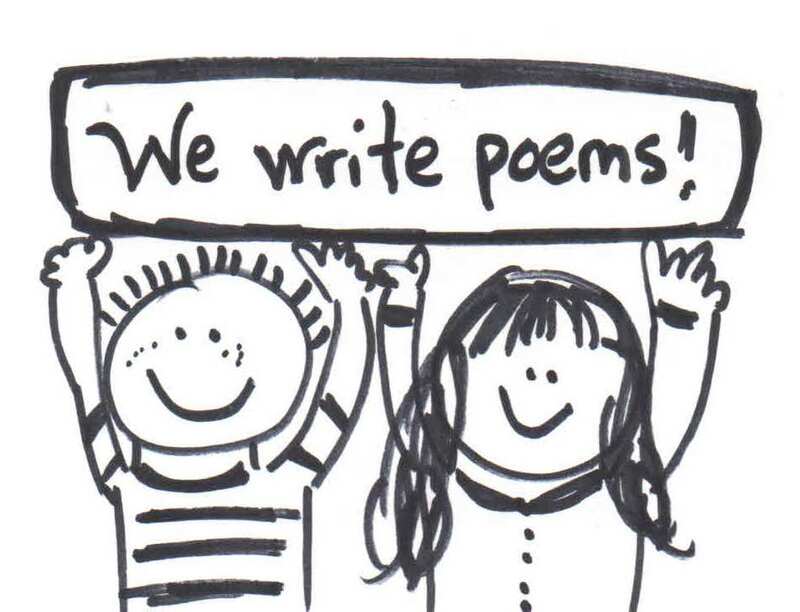 Fifth Grade Poems & Poetry Tips - Teacher Faith Catarella from Pinehurst Elementary in Lakeview, NY and her students share poems and thoughts about writing poetry. 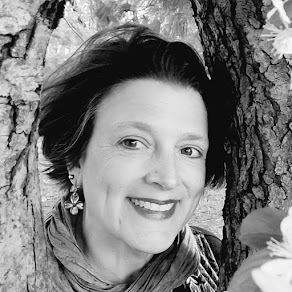 Poet of the Month - First grade teacher Lori Faas from Canalview Elementary in Spencerport, NY, shares how, inspired by Lee Bennett Hopkins suggestion in PASS THE POETRY PLEASE, she has begun a Poet of the Month feature. See her poet suggestions and tips in this post. Poem in Your Pocket Day - Bobbi Hopkins, a third grade teacher from Country Parkway Elementary in Williamsville, NY gives us a peek into her schools Poem in Your Pocket Day, complete with paper pockets and announcements. Poet Tree - First grade teacher Susan Kellner, at Harold O. Brumsted Elementary in Holland, NY, teaches us how her class published their poems on a 3-D poet tree. Poetry from the Soul - Fifth grade teacher Kyle Leonard and students, from Caledonia Mumford Elementary in Caledonia, NY, share their video poetry project and how they went from start to finish. 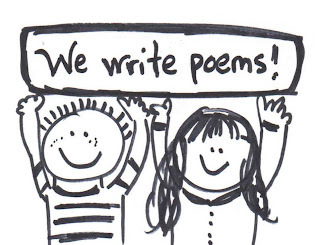 Community Poems - Fourth grade teacher Lynda Sentz and her students from Cloverbank Elementary in Hamburg, NY, share how they write poems together, creating poetry and community at the same time. Kindergarten Mask Poems - Kindergarten teacher Sallye Fogarty and her kindergarteners at Puster Elementary in Fairview, Texas, share their journey of poetry-discovery and some of their original mask poems. Poetry Breaks - Reading specialist Amy Merrill, at Calvin Coolige Elementary in Binghamton, NY, tells how inspired by librarian Caroline Feller Bauer, she leads her school in regular "poetry breaks!" She also shares her virtual poetry library and thoughts about beginning a nursery rhyme poetry break. Poetry Calendars - Fourth grade teacher Theresa Annello speaks of her love of poetry and threading it through the year and also leads us through her class's project of making poetry calendars as holiday gifts. There are many links here to help you make this project your own. Classroom Publishing Station - Intermediate Literacy Coordinator Kristie Miner and fourth grade teacher Ken Hand from Tioughnioga Elementary in Whitney Point, NY, share their classroom publishing station. See photos detailing the station and read the students' beautifully published poetry. Poetry Immersion - Fourth grade teacher Melinda from Iroquois Elementary in Elma, NY offers some thoughts about sharing poetry at dismissal, poetry folders, and tells about her classroom's "Poetry Pause." You can read two student poems inspired by this special time. Grade Two Haiku - Second grade teacher Bonnie Evancho and her students from Pinehurst Elementary in Lakeview, NY share a favorite haiku mentor text and some haiku of their own. 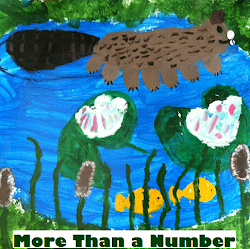 Blogging on One Topic/Many Poems - Jamie Palmer, a fifth grade teacher from Klem South Elementary in Webster, NY and her students tell about how they each wrote about one topic through many lenses. This is a project we took on together at The Poem Farm, and here you can read some of the poems and student words around their poems. Poetry Gifts - Second Grade teacher Dale Sondericker at Wales Primary in Elma, NY, tells how he found the perfect poem-gifts for each of his students. See his bulletin board, suggestions, and a heartwarming story about Poem in Your Pocket Day. Third Grade Poet Feature - Rosanne Kulikowski, a third grade teacher from Klem South Elementary in Webster, NY, introduces a student writer who shares a few poems as well as her thoughts about writing poetry. First Grade Poetry Love - Terry Semlitsch, a mother and teacher at Wales Primary in Marilla, NY, tells about and shares photographs of how her son's classroom poetry culture inspired a love of writing and a joy in displaying his poetry at home. 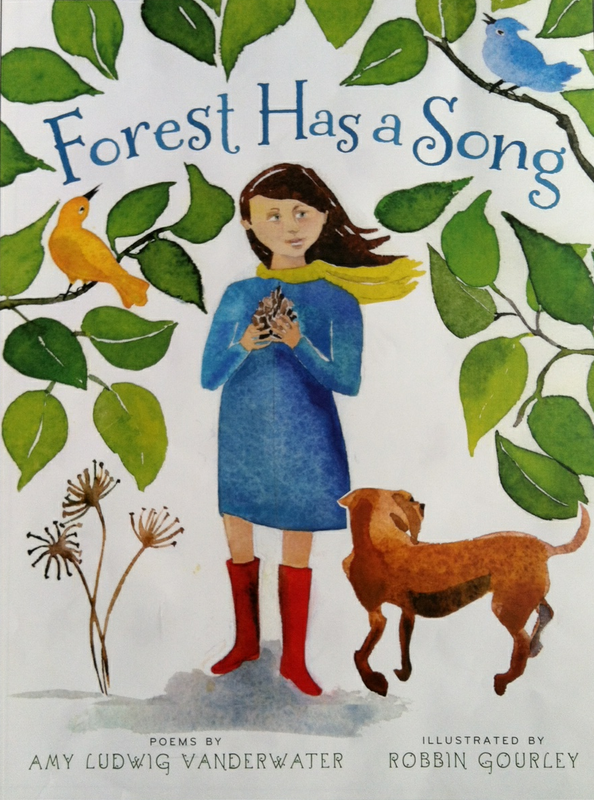 Primary Poetry Anthology - First grade teacher Kate Sacco and her students at Franklin Elementary in Buffalo, NY, tell about their poetry unit from using a Mobi to making a poet tree to writing a classroom anthology. You can read a few student poems and quotes about poem-making here. Poems Around Town - Librarian and storyteller Annemarie Jason from Marilla Primary in Elma, NY, explains how she brought the explosion of poetry, basket-by-basket, into the town. This post also includes a celebration of one young poet's work. Upper Grade Memoir Poems - Literacy coach Linda Baie from The Logan School for Creative Learning in Denver, CO, details how she helped her students write their own memoir poetry. 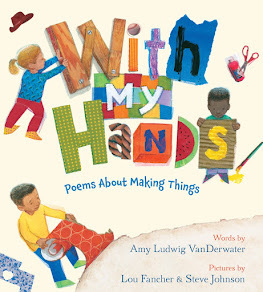 From mentor texts to a description of the writing workshop context in her school, Linda's words and her students' poems are a wonderful place to begin with such a project. Backstage for BOOKSPEAK - Poet Laurie Purdie Salas takes us backstage for a sneak-peek into her book BOOKSPEAK and also shares a poetry idea for all writers to try. L is for LEE - Poet, anthologist, and promoter of poetry Lee Bennett Hopkins shares a few of his thoughts about what makes him fall in love with a poem as well as his own poetry history and some wise advice for students. 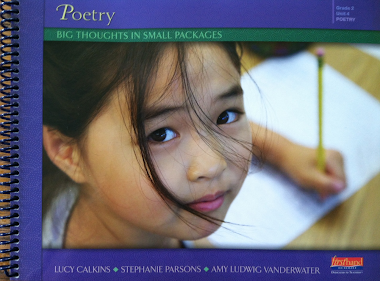 S is for SYLVIA - Professor and author Sylvia Vardell offers some valuable suggestions for sharing poetry in the classroom from her book THE POETRY TEACHER'S BOOK OF LISTS. Student Dictionary Hike Guest - A sixth grade student (my daughter Georgia) shares her process and a poem from her own Dictionary Hike. Personal Poem Challenge - Poet Charles Waters shares how he took on a poetry writing challenge of his own, inspired by a word list here at The Poem Farm. Brother Poet Celebration - Fifth grade teachers Kristen Domino and Joe Long from Iroquois Intermediate in Elma, NY, explain how the structure of their writing workshops nurtures young writers such as the twin poets celebrated here. Each boy shares poems, tells of his process, and their mom says a bit about the home life which helped guide their writing. Poetry as Language Support - Speech Language Pathologist Stacey Buck, from Chicago, IL, shares how poetry supports the work of her students. In this post, Stacey details ways to let poetry inform students' reading, writing, and language understandings. In addition, one of her students shares a poem along with her revisions and thoughts. Hummingbird as Teacher - Poet and artist Susan Taylor Brown offers a few words about how a hummingbird has helped her to see. First Grade Poet Feature - First grade teacher Susan Kellner, from Harold O. Brumsted Elementary in Holland, NY, joins us again to share how she helps her students fall in love with poems. In this post, one particular student shares her whole own anthology, page-by-page-by-beautiful-page. Kindergarten Rhyme School - Kindergarten teacher Betsy Hubbard, from Fern Parsons Elementary in Olivet Michigan, tells all about how her students learned to observe, explore poetry, write poetry, and make a classroom anthology of their work. This post includes a slide show of the poems, typed and illustrated. Poems All Year Long - Second/third grade teacher Karen Harter celebrates her young poets by sharing the class's writing process and opening her classroom so that we can read one poem from each writer. A Poet Tea and More - Second grade teacher Barbara Phillips from Monroe Elementary in Monroe, OH, takes us on a tour of her class's Poet Tea for Mother's Day. From skywishes to a chalk-a-bration to writing from words, the lead-up to the Tea was as full as the Tea itself. If They Were Cats... - Third grade teacher Marianne Ferrara and her students from Klem North Elementary in Webster, NY visit with their poems and prose notebook responses to the poem "If I were my dog for just one day." Childhood & Edible Books - October 30, 2012 - Dee Michel, Eve Merriam's son, shares his edible book representing his mother's poem, "How to Eat a Poem" along with some of his other wonderful edible books. In addition, he tells about his childhood and shares some of his own favorite poems. This is an ever-growing list, and I invite you to share a post too! If you're interested, please just drop me a line to amy at amylv dot com or leave a message on The Poem Farm Facebook page.